If you're looking for an online slot that stands out from the crowd, search no more – Play'n Go's Golden Ticket is more entertaining and more lucrative than anything Willy Wonka gave away. You'll tumble through a world of quirky characters, falling symbols and innovative multipliers without a chocolate bar in sight when you play the Golden Ticket slot game. 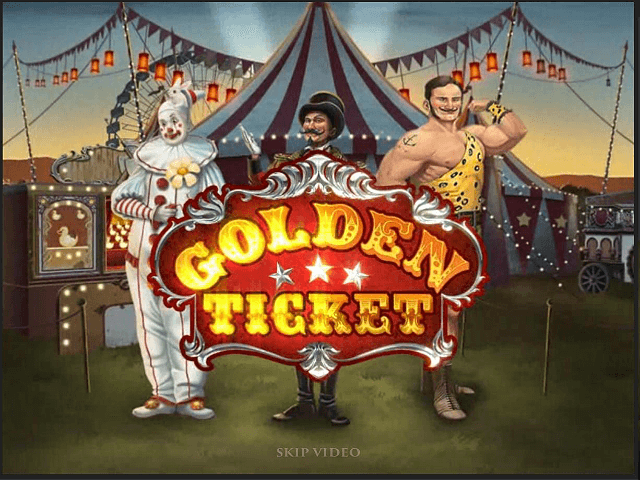 For a greater insight into what makes this online spinner so different from its peers, stick with us for the next few minutes as we present to you our Golden Ticket slot review. 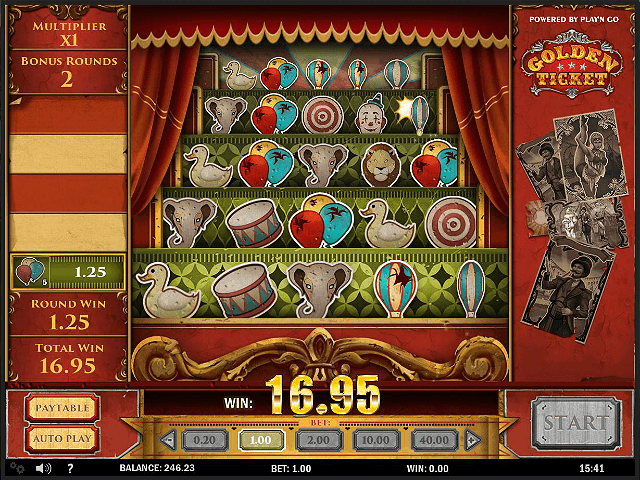 Play'n Go online slots are notable for their engaging themes – and Golden Ticket is a prime example. The moment you load the game, a video sequence kicks into life and you're invited to "roll up, roll up" and experience the thrill of the circus. Once inside, this story is brought to life via a combination of tumbling reels (symbols fall instead of spin), live action circus characters and unique bonuses that bring a touch of entertainment to the mix. 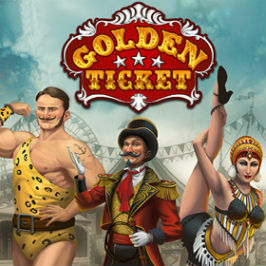 Naturally, the Golden Ticket slot game wouldn't be so golden if the software provider simply filled it with interesting animations and nothing else. Fortunately, this fact hasn't been lost on the design team at Play'n Go, which is why you'll not only find a payout table filled with generous prizes, but two Golden Ticket special features designed to give you more ways to win. But before you can start playing for in-game bonuses and the like, you'll need to pay your entry fee or, to put it another way, set your bets. 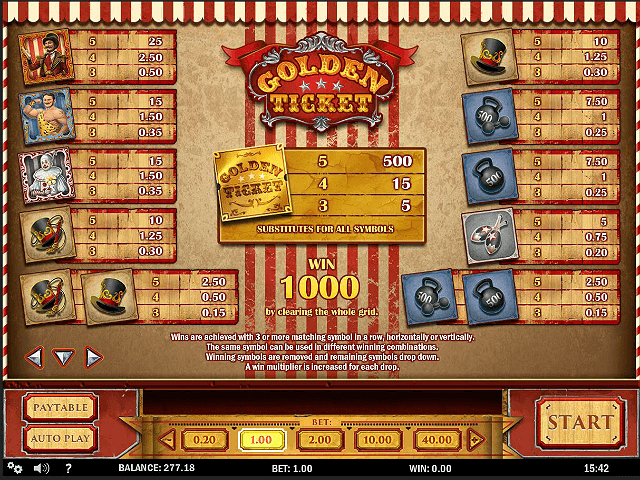 To start the Golden Ticket slot game, the first thing you need to choose is your bet size. In the interest of simplicity, the design team has created a banner (which looks like one you'd see at the circus) that displays whole cash amounts. So, instead of tinkering with coins, lines and bets per line, you simply have to choose a single cash amount. Under the rules of this game, the minimum bet is 0.20 and the max bet is 40. Once you've set your bets, the five reels are ready to go and all you have to do is hit the start button. At this point the symbols will fall from the top of the reels while those underneath disappear out of view. This is technically known as a cascading reels feature and leads us on to two very important points that we'll discuss in the next section. The first thing to note about Golden Ticket is that there aren't any paylines in the traditional sense. Instead, much like a game of Tetris, touching symbols (they must be matching symbols) will create a win. The benefit of this is that you can actually make more than one winning combination from a single bet. The other benefit of this cascading function is that it can trigger a series of additional wins. Put simply, once you roll in a win, the matching symbols will disappear and new blocks will fall. As the old blocks disappear your multiplier will increase by one and, if the new blocks help form another win, the prize will be increased. This process of old and new blocks replacing each other after every win can continue indefinitely, which basically means a single bet can trigger an indefinite chain reaction of wins. 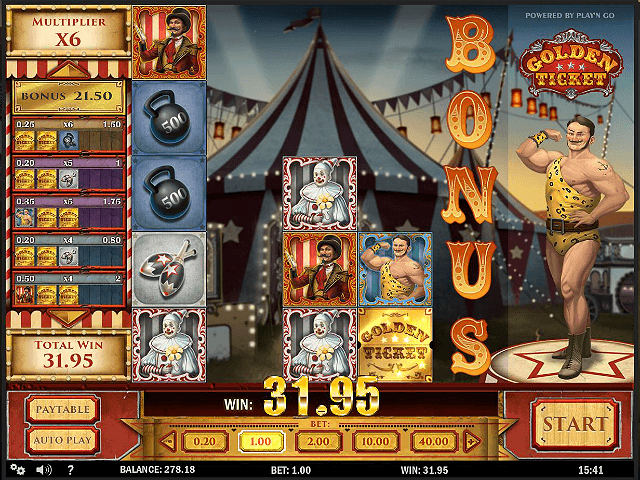 To add a final level of shine to this online slot, the software provider has included a bonus round. If you can reveal the word 'BONUS' in one or more columns, you'll win free spins and the chance to pick mystery prizes. When you combine this with a cascading reels feature that has the power to set off a sequence of wins that may never end, it's easy to see why Golden Ticket is one of the most lucrative online slots around today. If you like Golden Ticket - You'll like these slots too!